Nick has been playing for Ting Tong for many years. He is also a keen golfer and that makes him even harder to beat on the pool table. Kiki Sports Bar played away against Genius. Top player from Holland, William, was back but the two Thai players Jack and Mac were missing. Wan, Poy, Rat and Li all playing from Genius were winning their singles and doubles games. It looked like being a very difficult night for Kiki Sports Bar, who has been doing pretty good in the league so far. The beer leg was a three-setter and also won by Genius, who had very comfortable 9-3 victory on the evening. Champs bar played at home against Martin Swiss. Simon and Mad Mick playing for Champs bar won their singles and doubles game, but so did Kid and Martin playing for Martin Swiss. 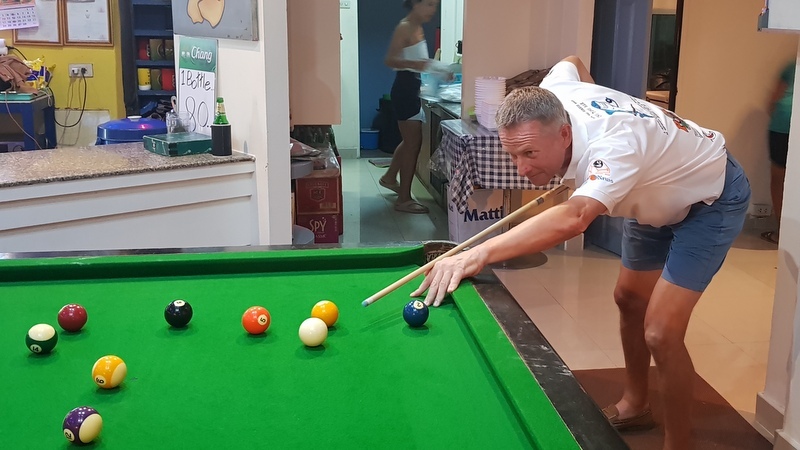 It was not a good evening for Martin Swiss as three of their players potted the black ball in the wrong pocket, but the beer leg was a three-setter won by Martin Swiss, though the overall result was a 6-6 draw. Red Light played away against Kwan’s Birdie Team in Kathu. Monday was Kwan’s birthday and fat-boy Colin managed to break the floor. We think Kwan rather had preferred chocolate or something else. So repairs had to be made in time to make it possible to play the match on Thursday. Colin redeemed himself by winning his single and double games and so did the other Kwan’s Birdie players Goh, Se and Mike. 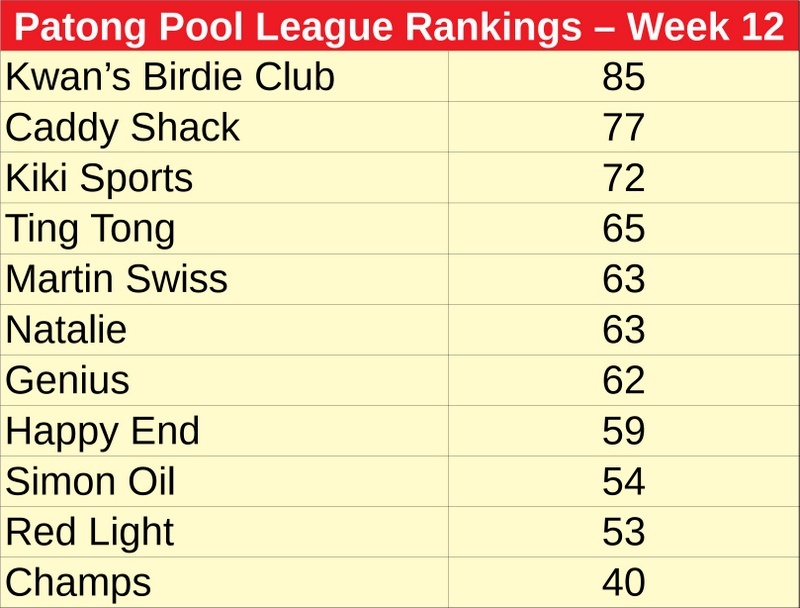 The beer leg was also a three-setter and won by Kwan’s Birdie, who won the evening 10-2, further strengthening their position at the top of the table. Simon and Oil played at home against Caddy Shack. Luke playing for Simon and Oil finally won his single and double games again. However, Caddy Shack’s Lee, Shaun, Don and Trevor (aka “Young Man”) also won their singles and doubles games. The beer leg was yet another three-setter and won by Simon and Oil, but Caddy Shack won the evening with a score of 7-5. Happy End played away against Ting Tong bar. Ting Tong Team started strongly and won five of the six singles games. However, Happy End came back in the doubles and was able to win the beer leg in three sets. All games were pretty close and exciting for the visitors to watch. The final result was a marginal 6-5 victory for Ting Tong. The 13th round of Patong Pool League will be played on Feb 14. People interested playing as well as visitors are all welcome to attend at one of the 12 participating bars. For more information, visit the Patong Friendly Pool League Facebook page.